I have been thinking about this for a little while now and every time I open my drinks cabinet – which is very often I will say!!! I see this bottle of “Baileys Chocolat Luxe” staring at me. It’s crying out to be used up. I had a dinner party last week and decided to make good use of it. 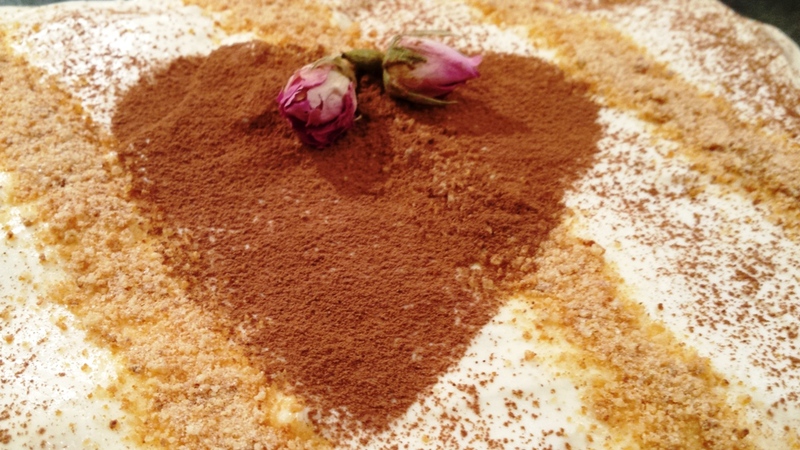 Tiramisu is liked by many. It is very much a party sharing dessert and easy to serve. My husband & friends like Tiramisu but strangely enough I have not made it for quite some time, so it was well overdue. If you’re a fan of Baileys Cream I am sure this one will be a great dessert for you, an added twist to a much loved dessert. 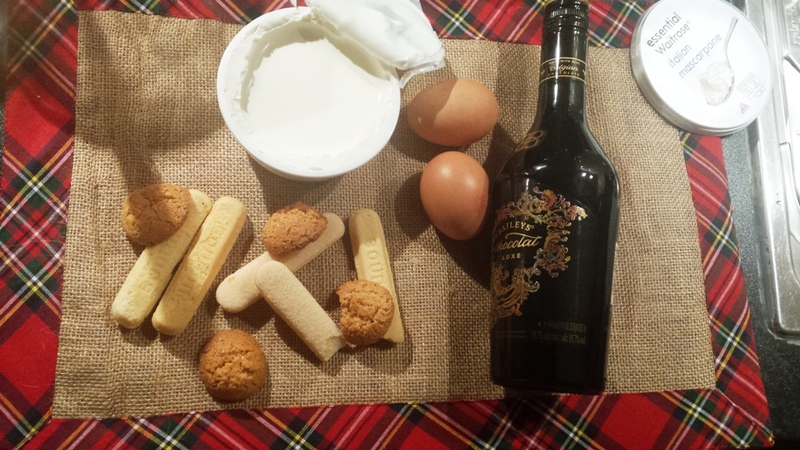 The other change I made to this recipe was to use a mixture of sponge fingers and amaretto biscuits. Wooow! The combination was perfect. The crunch and almond flavored biscuits made this dessert even tastier. Tiramisu looks so impressive every time it’s brought to the table. When cutting through the layers with the soft textured coffee and alcohol soaked sponge fingers and cream, it certainly looks complicated to make and yet it’s ridiculously so easy to do. I would always recommend you to make it the night before as it always tastes better the next day. No doubt I decided to share this recipe today on this Valentine Day Special. Who can resist chocolate, cream and delicious dessert on such an occasion. (See my note below for other ingredients and vegetarian option). Begin by combining ¾ cup of the chocolate Baileys with the espresso or strong coffee. Set aside. Layer half of the biscuits alternately in a shallow glass dish, pour half of the coffee mixture over the biscuits; let them soak up the coffee liqueur add a bit more as required. Separate the eggs in two mixing bowl. Using an electric whisk the egg yolks and the sugar together until thick pale yellow and creamy. Add the mascarpone cheese to the mixture, followed by two tablespoon of the baileys mixture. I purposely do not add too much of the baileys mixture, as it’s a chocolate one adding too much will change the colour of my mascarpone mixture. Mix all until well incorporated. Whisk the egg white until thick and frothy. 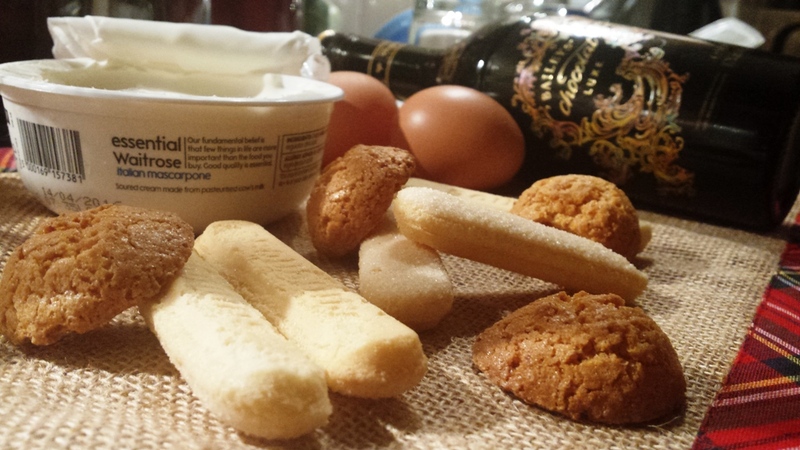 Fold the egg white into the mascarpone, and then spread half of this mixture on top of the layer of biscuits. Repeat with another layer of biscuits, spoon the remaining baileys mixture over the biscuits and then top with the remaining mascarpone mixture. Cover the dish with cling film and leave in the fridge overnight. Before serving; using a tea strainer sprinkle with powdered amaretto biscuits and cocoa powder to decorate the tiramisu. Brinda’s Note: You can use original Baileys Cream or the traditional Marsala wine for this dessert, the procedure remains the same. If you are not keen on using raw eggs and want a vegetarian version, substitute the eggs with condensed milk. But remember to reduce the amount of sugar.